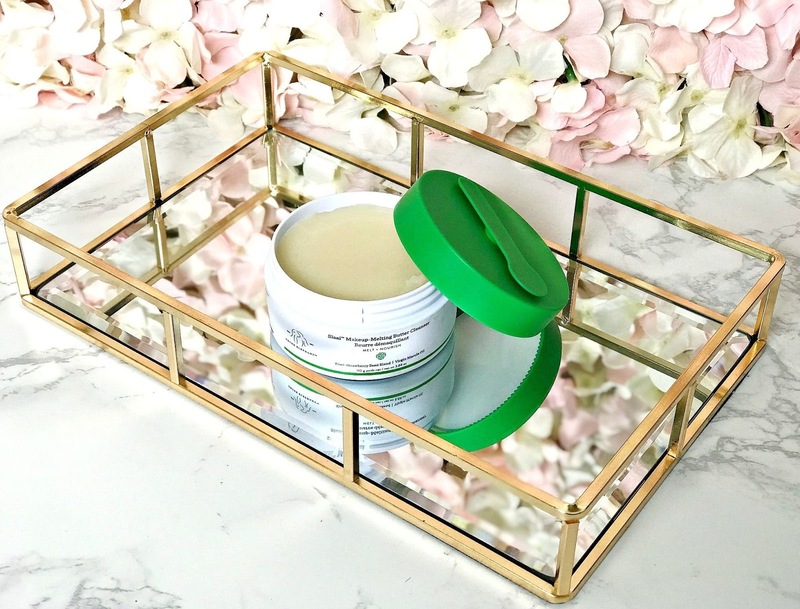 Firstly, I have to mention the packaging because I love the magnetic scoop that sits on the lid of the balm - genius idea and means that I won't lose it! There's a decent 110g of product in the tub and it's priced at £29, which I think is pretty good in comparison to other high end cleansing balms. I love the texture of this balm - it's not too firm that it feels like wax but also not too slippy so that it would feel more like a lotion. It feels very nourishing on the skin and is very pliable so it's easy to massage into the skin - it's a pleasure, in fact. It is applied to dry skin and when massaged in, it transforms into an oil (similar to the Pixi/Caroine Hirons solid cleansing oil). It melts every last scrap of makeup - even waterproof liner and it doesn't sting the eyes at all. When water is added, it emulsifies into a milk before being rinsed or removed with a flannel. Skin is left feeling soft, plump, nourished and deeply cleansed. As with all Drunk Elephant products, this balm is free from the 'suspicious six' - essential oils, silicones, drying alcohols, SLS, fragrance/dyes and chemical screens. The ingredient list includes some very nourishing ingredients - Safflower Seed Oil, Sunflower Seed Wax and Cranberry Seed Oil, to name a few. What I find curious about this cleansing balm is that every single time I use it, my skin looks quite red afterwards, however it isn't sore or irritated, in the slightest. The redness soon dissipates so it isn't a cause for concern but I find it a little unusual. Also included with the balm is a sample of Bamboo Booster, which is a very fine powder exfoliator, which can be added to the balm for some added exfoliation, when needed although the instructions say not to use this if you are using retinol. I really love this balm and think it is totally worth the hype. A little goes a long way with it, which makes it pretty good value for money. I love how it makes my skin feel and that it removes every scrap of makeup. I can see myself repurchasing this regularly! Have you tried Slaai yet? I'd love to hear your thoughts! I'm taking a short blog break because I'm going away for 4 nights and I like to totally switch off when I'm away but there will be a nw post again soon!